Dedicated and successful criminal psychologist Dr. Miranda Grey (Halle Berry) awakens to find herself a patient in her own mental institution with no memory of the murder she's apparently committed. She soon learns that her husband was brutally murdered three days earlier, and the bloody evidence points directly at her. With no memory of that night except for a cryptic encounter with a mysterious young girl, the doctor's behavior becomes increasingly erratic. Her claims of innocence are seen by her friends, colleagues and former patients as the beginnings of a deep descent into madness. As Miranda struggles to reclaim her sanity she soon realizes she's become the pawn of a vengeful spirit. Now she must quickly determine if she is being led farther from her sanity or closer to the truth. Download Gothika in Digital HD from the iTunes store. Gothika images are © Warner Bros.. All Rights Reserved. After winning the Oscar for Best Actress for her performance in Monster's Ball, Halle Berry's took a very dark and disappointing turn. Perhaps the single most critically panned film in the years the followed was the ill-fated "Catwoman" in which the only watch able thing was Berry in her cat suit. 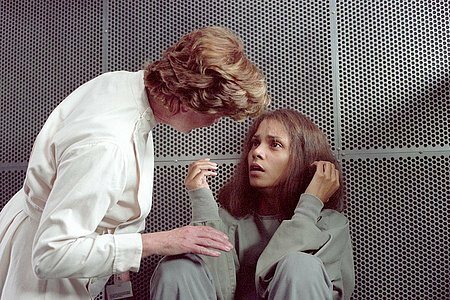 Another, less well known, dark entry into Berry's post Oscar career was 2003's "Gothika". A rehash of many other films in the genre (ghost connects with person, ghost leads person to their killer, ghost is finally redeemed) the film is predictable, yet has a certain edge to its feel and cinematography which makes it a decent rent for a dark and stormy night. Berry stars as psychiatrist Miranda Grey, who after being detoured from her regular route due to inclement weather, runs her car off the road after almost hitting a ghostly presence of a young girl. In one of the films few ironic twists, she wakes up in the very mental ward in which she works, only she is strapped into a straight jacket with no recollection of what happened or why she is determined to be insane. The rest of the film involves the ghost contacting Miranda through various channels which further the other doctor's diagnosis of her insanity while her own mental state begins to break down. Finally the ghost leads Miranda to her killer who turns out to be someone Miranda is very close with. Through flickering light effects and dark, intense scenes, the film makers succeed in creating some suspense and intrigue in the story but about midway through the viewer already knows where this is all going. A final twist in who the killer is leaves a little sense of "ooh" but its more "ooh kaaay" rather than "oh my!" Gothika images © Warner Bros.. All Rights Reserved.